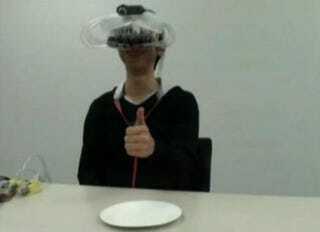 Augmented reality, in which computer-generated virtual imagery is used to alter a person's perception, has been used to help people overcome phobias and help people drive better. And now, for some (awesome) reason, there's this... an augmented reality cookie. Meta Cookie is the creation of researchers at the University of Tokyo. Thanks to that huge helmet, the plain, tasteless cookie can suddenly taste like chocolate chip, lemon, almond, or even a cheese cookie, depending on the settings. The researchers noted that "augmented gustation", as they call it, is particularly challenging because taste relies on a lot of other senses, in particular sight (we see what a cookie looks like, of course) and smell. But they were able to turn that fact to their advantage by augmenting all three of those senses, completely altering the person's perception of the cookie. You can check out the video below (it's all subtitled, so no audio required) to see just how they pulled it off, as well as getting a better look at that truly ridiculous headgear.